photo-eye Gallery Rachel Phillips: Fixed – Portfolio & Interview photo-eye Gallery is thrilled to publish Fixed, a new series by artist Rachel Phillips to the Photographer's Showcase. 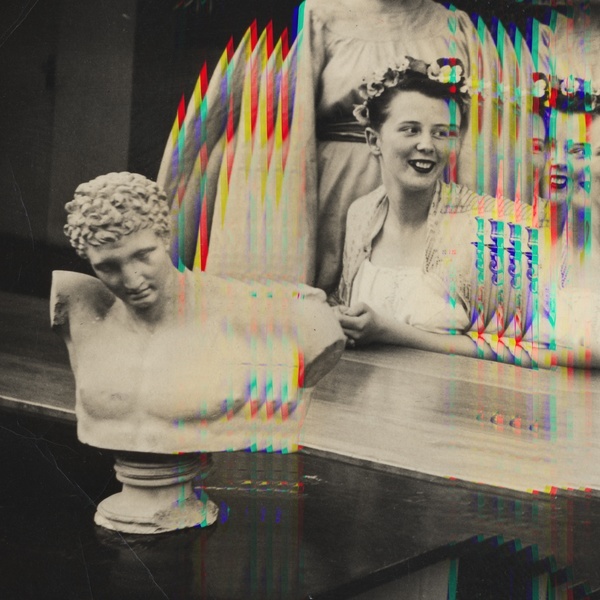 Fixed follows this summer’s Divinations series, and continues to explore notions of antique ephemera, vernacular photography, and photography's role in the Everyday. 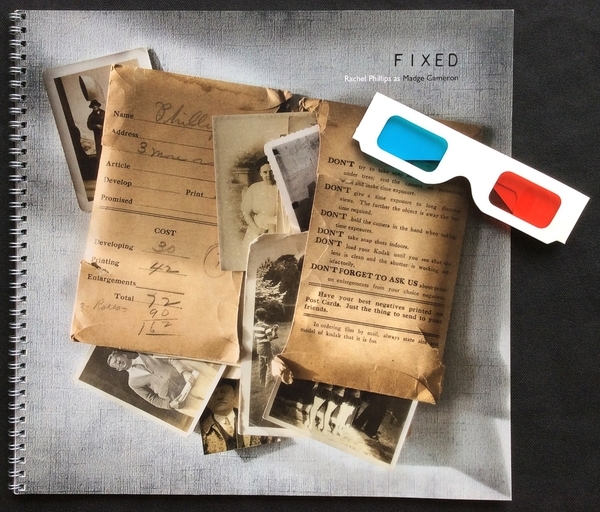 Fixed celebrates both the history of early photography and the shared humanity a simple portrait can convey. photo-eye Gallery is thrilled to publish Fixed, a new series by artist Rachel Phillips, to the Photographer's Showcase. This summer, photo-eye was proud to introduce and exhibit Phillips's Divinations alongside our Michael Kenna retrospective, and, following suit, Fixed continues to explore notions of antique ephemera, vernacular photography, and the photograph's role in the Everyday. Injecting the work with a sense of play, Fixed is created by Phillip's fictional alter-ego Madge Cameron, born 1935, Founding Archivist at the Pacific Library Privé and Special Collections, and each work is the product of an 'interruption' during the process of digitizing the library's photographic holdings. Gallery Associate Lucas Shaffer asked Phillips to detail more about Madge, how the project came to be, as well as how it fits in with Phillips's previous work. Lucas Shaffer: Who’s Madge Cameron and why did you feel like creating a persona for Fixed? Rachel Phillips: Madge Cameron is an alter-ego—an aged librarian at the fictional Pacific Library and Archive in San Francisco. I created her as part of an artist residency where I staged a fake group show of work by a league of fictional artists. Madge was one of my better inventions from that show, and I decided to keep her. More about her biography (including pictures!) is included in the book version of the project. LS: Where do the images come from? RP: The story goes that they are snapshots from Madge Cameron's archive that she is struggling to digitize. LS: How is Fixed connected to your other bodies of work, and your interest in antique ephemera? RP: Without any plan, I started buying snapshots (which became Fixed) while collecting cabinet cards for my series Divinations. You can't help but buy snaps when you see the big boxes full of them at ephemera fairs—it's a treasure trove! 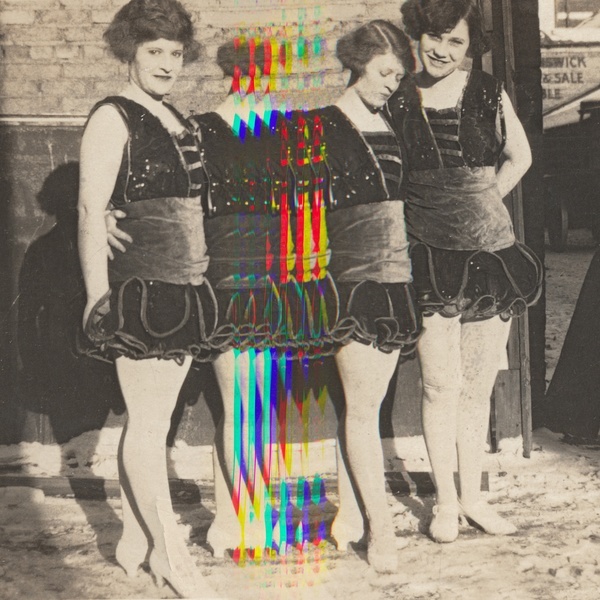 Working with snapshots felt like a natural evolution from using 19th-century cabinet cards, and parallels the history of photography: the advent of the Kodak Brownie meant the end of the cabinet card era as people began taking their own pictures rather than sitting for a formal portrait at a professional photographer's studio. I love the great variety and spontaneity of snapshots in contrast to the earlier formal cabinet portraits, yet there are challenges to working with them—they are so varied, small, often technically imperfect and in poor condition. 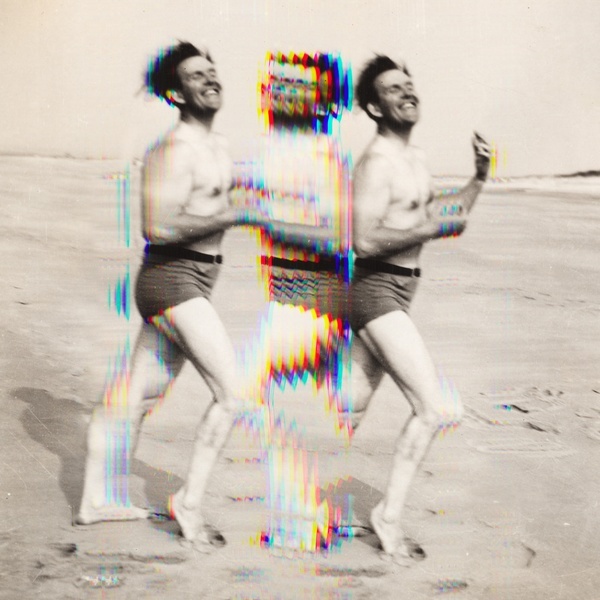 Each series, Divinations and Fixed, employs an alteration of the original photograph, but the characters of cabinet cards versus snapshots requires the alteration to be different—it is a physical alteration for Divinations and a digital alteration for Fixed. The materials teach me to adapt to them. LS: Do you have a favorite image from the series and if so – can you describe how it was made? The process of making each piece in Fixed is simple: essentially moving the snapshot while it is being digitized to create artifacts. Every once in awhile my computer will crash before I'm able to save a file, so, of course, I always feel that the greatest pieces are the ones that get away! The digitizing process allowing me to, let's say, "direct attention" in a snapshot. Often, what attracts me to a snapshot is a small detail you only find by really leaning in and scrutinizing. 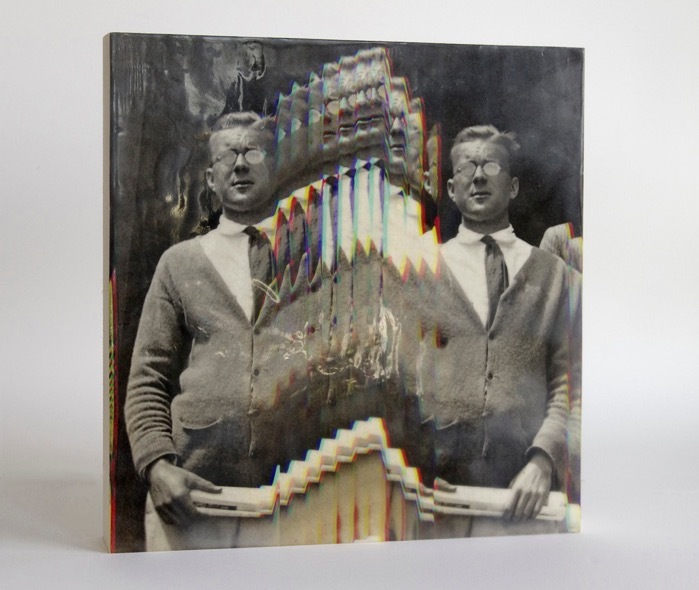 After all, these are not carefully composed, tightly edited, beautifully printed images! The process of altering these snapshots for Fixed allows me to make the details I love about these snapshots more central. I build little stories in my head for the pieces. For example, I love the showgirls in those outrageous cummerbunds lined up in the snow—I imagine they have all be herded outside, freezing, because it was too dark to make the snap inside. Or, the image of the young woman wearing some sort of toga for a Greek party. Her hair mirrors the hair on the statue and though she is young and lovely, we see she is also missing a tooth! There is a poignant humanity in that to me, and each photograph has a revealing moment like that. LS: How did the 3D aspect of the work arise? The 3D aspect of the work was a happy discovery when I started experimenting with the glitchy digitizing. Each channel of light is recorded separately, and when you move the snapshot those channels get out of sync and you see the color bands. I saw that and thought, "Wow, looks sort of 3D. Wonder how they would look with glasses?" And, it's an interesting prismatic effect. I also like it as a slightly over-the-top addition to the project. I didn't want Madge to be too "fine art." I hope it makes her self-deprecating. Art ought to be allowed some fun! The book, which is twelve inches square, the same size as the encaustic wall panels, was a great vehicle for the project because I could include a biography of Madge and explain the premise a little more. I'm really proud to share authorship with Madge! Works from Fixed are printed with Archival Pigment Inks, mounted to birch panels, and available in limited editions of 8 starting at $600. For more information, and to purchase prints, please contact the Gallery Staff at 505.988.5152 x 202 or gallery@photoeye.com.